Cost to repair roof leaks varies greatly by region (and even by zip code). Get free estimates from roofers in your city. Cost to repair roof leaks varies greatly by region (and even by zip code). Get free estimates from roofers in your city. The average cost of reparing roof leaks is $630​. How much does it cost to repair roof leaks? A leaking roof is more than just a nuisance: it’s a gateway to major home damage. That’s why it’s always best to repair roof leaks as soon as they’re discovered. In this guide, we examine the cost of repairing a roof leak in a 10'x10' area, which entails replacing the plywood 1, asphalt shingles, and flashing 2 where the leak has occurred. The average cost of this is $630. Inspect for leaks by entering your attic on a rainy day and looking for signs of dampness, mold, odor, or damage to the wood rafters. All of these are symptoms of a leak, the most obvious being standing puddles and water dripping through the roof. If it’s not raining, you can also run your hose over your roof and see if any of the water comes through. Some signs of a leak can be hard to spot. That’s why it’s suggested that you hire professionals to do a thorough inspection. They can help you confirm if you have a leak, and find other leaks that you might not have noticed. Roof inspections cost $250-$450. Check with your local authorities to see if your city/county will cover the inspection fee. If your roof is too badly damaged, it may be useless to try to spot-repair the leaks and other issues. To ensure the structural safety of your home and prevent the need for additional repairs, it can be simpler to just replace the entire roof. 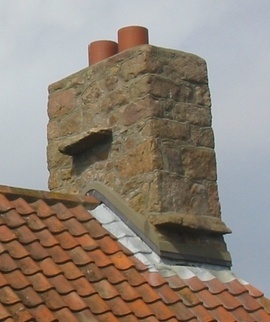 The replacement of the roof costs an average of $6000. A roofing contractor will usually charge around $3 per square foot for a leak repair project, or $45-$75 per hour. Roof leak repairs usually take one to two days (8-16 labor hours - $360-$1200) to complete. Flashing 2 $10-$20 - new flashing may or may not be necessary for your project. Having clogged gutters can put strain on your roof and make it more prone to leaks. The average cost of gutter cleaning services is $90 per visit, or $0.50-$1 per linear foot 1 of gutter. Expect to pay $50-$100 per each additional story of your home. Applying a waterproof sealant to your roof can prevent future leaks from forming. This usually costs $850-$1000 for the roof of an average 1500 sq.ft. home. Trusses 10 are the main architecture that hold your roof up, and are prone to damage from leaks. Water that drips through your roof can fall down on the trusses 10, soaking them and causing damage such as mold, rot, and cracking. 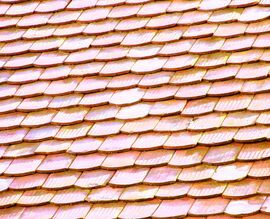 Costs depend on the extent of the damage and how much time your roofer will need for repair. You may need to have the damaged truss 10 completely replaced - the material cost of building one new truss is around $80. Count on at least 4 hours of labor ($180-$300) to build a new truss 10. Minor leaks can lead to major damage, such as mold, rotted framing and sheathing, destroyed insulation and damaged ceilings. If this happens, you’ll have to not only repair the leak, but fix any other resulting issues. Check our cost guides to find the prices associated with whatever type of damage you’re dealing with. If you are performing roof repairs or replacing your roof completely, you may need to get a permit from your county or homeowners association (HOA). You could be fined heavily if you don’t. Permit fees depend on your location, but average at $75. If your roof is steeper than average, you can expect your repair costs to increase by 20% or more. This is largely due to the increased time contractors will need to safely perform the repairs. You can expect the same rise in costs if your roof has many architectural details to work around (chimneys, awnings, etc.). 3 Shingles: A smooth, uniform, flat piece of construction material, available in a wide variety of materials and laid in a series of overlapping rows, used to cover the outside of roofs or walls to protect against weather damage and leaks. How much does it cost to repair roof leaks in my city? Cost to repair roof leaks varies greatly by region (and even by zip code). To get free estimates from local contractors, please indicate yours. Pieces of sheet metal used on roofs to cover joints, such as where the roof meets the wall, or around a chimney or skylight, to protect them and prevent water leaking through. 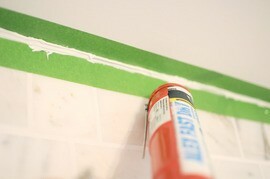 A chemical sealant used to fill in and seal gaps where two materials join, for example, the tub and tile, to create a watertight and airtight seal. The term \"caulking\" is also used to refer to the process of applying this type of sealant. Hardware used to attach two or more objects to each other. A common example is a nail. Cost Considerations: Make sure to choose the best fasteners for the job even if they cost more, because removing and replacing rusted ones will cost more than buying corrosion-resistant fasteners to begin with. 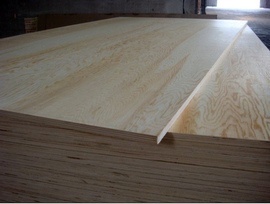 A fold, line, or groove where two pieces of material join together. Cost Considerations: Installing channel molding for 200 linear feet of trim can cost between $130 and $160. 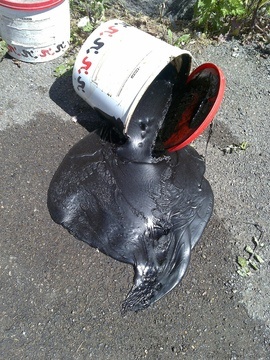 A viscous, black mixture of hydrocarbons often used for roofing and waterproofing. It is also used in asphalt for paving roads. A fine-grained rock, typically bluish-gray in color, that can easily be split into thin layers and is commonly used as a roofing material. Cost Considerations: Slate is one of the most expensive roofing materials available. It averages $10 to $20 per square foot ($15,000 to $30,000 for a 1,500 square foot roof). 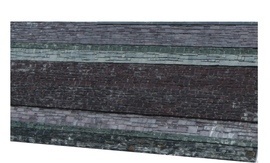 Slate that is very unique or thick can run up to $50 per square foot. Roofing material laid underneath roofing tiles to seal the roof, preventing leaks. Cost Considerations: Underlayment costs approximately $61 per square excluding labor. 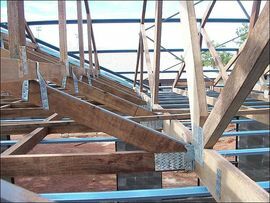 Structural framework used to support a roof. Cost Considerations: Prices vary greatly by size, material, and type. Generally speaking, trusses run from $3.90 to $4.40 per square foot of building area.